Federal Reserve Chairman Ben Bernanke gave a lecture to a class at George Washington University, telling students that monetary policy did not cause the housing bubble. NEW YORK (CNNMoney) -- The Federal Reserve isn't to blame for the housing bubble, Ben Bernanke told a lecture hall full of college students Thursday. But the students wouldn't let the Fed Chairman off the hook. "The slides on the housing bubble show how clearly one thing led to another," said Daniel Lippman, a senior at George Washington University. "When you were observing the economy in the 2000s, what did you think would happen to rising house prices and the housing bubble?" Bernanke responded: "Well, as I tried to argue, the decline in house prices by itself was not obviously a major threat." "It was that whole chain of events that was critical," he added. Earlier in the lecture, Bernanke said the Fed had little to do with home prices that rose rapidly in the early 2000s, and then came crashing down. Bernanke pointed to housing booms and busts around the world as evidence that the rise in real estate prices was not limited to the United States and the Fed's area of influence. He also cited research by economist Robert Shiller showing the housing bubble began in 1998 -- three years before the Fed started slashing interest rates -- making it cheaper to get a mortgage. "You'll probably hear different points of view, but the evidence that I've seen and that we've done within the Fed suggests that monetary policy did not play an important role in raising house prices during the upswing," Bernanke said. The lecture was part of a four-part series at George Washington University that continues next week. 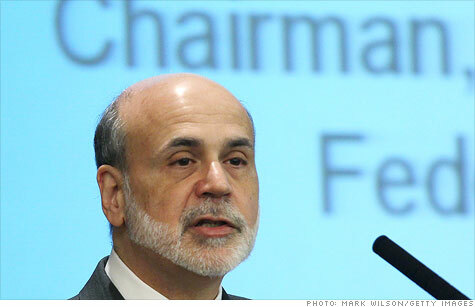 The Federal Reserve posts Bernanke's slides and full videos online.